These mock driving test videos show me giving pupils a pretend driving test. These are real test routes from real test centres in Birmingham. I do sometimes alter them slightly so people don’t try and just memorise the route. The videos in the box below show the driving test in it’s most current format. I took part in the trials of this new test back in 2015 before many driving instructors even knew it was changing so I have a wealth of experience when it comes to the new driving test. I’ve sat in on well over 300 driving tests in my career. I know exactly what driving test examiners look for, what would pass and what wouldn’t. So long as it wouldn’t distract you I always recommend taking your driving instructor on test with you because they can help you more whatever the result. Be sure to subscribe to my YouTube channel and give them a like! These videos show older mock driving tests in the previous test format without the sat nav and with the show me question done at the start. The test routes, marking and other things on the new test are still the same, or very similar, as they were when these were filmed. Safe driving is safe driving no matter what test criteria you’re working to. 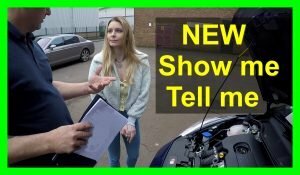 I have a page dedicated to the Show me Tell me part of the driving test. This is where the examiner will ask you to tell them something about the car before your test begins. They ask you to show them something about it as you’re moving. Visit my Show me Tell me page for more details. You can even watch a pupil and an examiner going through each of the questions and answers for you. Watch Charlie and the examiner going through all of the show me tell me questions and answers.